A revolutionary launcher powered by compressed air could boost submarines’ ability to evade torpedo attacks. Every submarine film has that moment. The moment when a torpedo is launched towards the submarine. There’s the tension. The panicked looks. The pings of the sonar. The focused concentration. And someone, always, ends up shouting ’Dive! Dive! Dive!’ as the submarine takes evasive action. While evasive manoeuvres are important for avoiding torpedo attack, for the past decade or so, the marine defence sector has been developing anti-submarine countermeasures. These are devices that can be launched from the submarine to trick the torpedo’s tracking system into following them, rather than the target. However, finding ways to launch these devices has proved rather difficult. A team from Babcock has now come up with a new type of launcher, designed with safety as a priority, which can be retrofitted onto the current submarine fleet to provide an extra layer of protection against a form of attack that all submariners hope will never come. Torpedos hunt acoustically, explained Jeff Owens, future business director for Babcock’s Marine and Technology Division. ’If there’s a torpedo coming towards you, you want to put a countermeasure in the water that “looks” very much like you do from the torpedo’s point of view, so that you can then quietly move away from the torpedo,’ he told The Engineer. However, a lot of submarines don’t have the capability to launch countermeasures, partly because it takes such a long time to design and build submarines. ’They’ve been introduced over the past decade, but the cycle time is so long that that’s recent, really,’ Owens said. Some submarines have internal launch systems, positioned inside the pressure hull and shooting their armaments through the outer casing, but these systems aren’t suitable for countermeasures. The solution that Babcock has developed is a launcher system that sits under the submarine’s outer casing but outside the pressure hull. This makes it relatively easy to install, because the pressure hull itself does not need to be pierced and then repaired. The launcher itself is, in basic terms, a compressed-air powered catapult. ’It consists of three composite tubes arranged parallel to each other,’ explained Owens. One of these contains the countermeasure itself; one contains a piston, attached to a cable whose other end is attached to a pusher device behind the countermeasure. 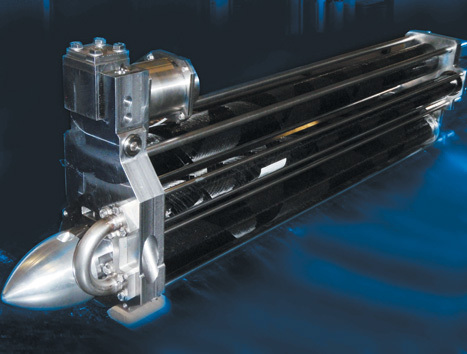 The system is controlled by a solenoid valve. 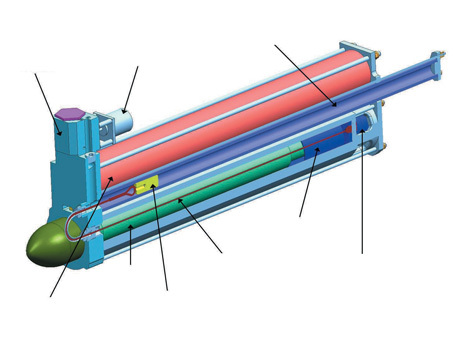 ’When the launcher is operated, the solenoid opens and the air from the reservoir is released into the piston tube. 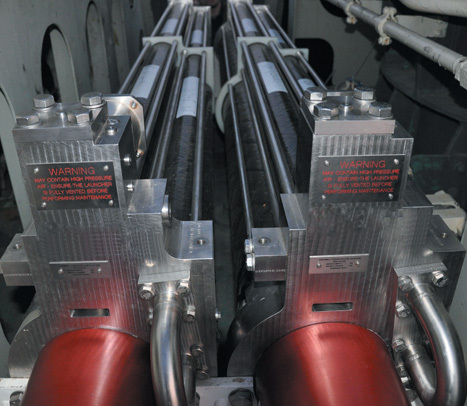 The piston pulls the cable, which in turn pulls on the pusher device in the launcher tube, and the stored countermeasure is hauled out of the tube and into the water. The launch air is kept within the system, so there’s no release of gas into the water; this maintains the submarine’s stealthy acoustic performance and helps it escape. Babcock used a model-based design approach for the launcher, using a digital model to simulate the physics of the launch system. This, Owens explained, was a way of reducing risk in the design process: the model allowed the teams to identify and quantify the stresses the system would encounter and have to overcome throughout the various stages of the launch process. The model was used to appraise concept designs, to understand the trade-offs that would be necessary to make the concept into a reality and to estimate the key design parameters. Babcock uses an adapted method to track the design process as it evolvesModel-based design is a technique that Babcock has adapted from the control and instrumentation sector, in which it simulates the way that processes occurring in the plant depend on the control system’s operation and vice-versa. It is also used for safety-critical process design in the aerospace, defence and automotive sectors. As the system models the physics of the process, the effects of different subsystems and design tweaks can be seen as the design process evolves. It also allows members of the developing team to see how their input affects the system’s operation and assists with communication between team members something that is notoriously difficult in multidisciplinary engineering teams.